Hip hop provides and has been providing a voice for the voiceless, the disenfranchised for decades since its origins in New York. The very existence of it is a political act in itself. However non-American hip hop has long been dismissed as perhaps not representative or not deserving of the weight of its predecessor. Griffith Rollefson’s new book ‘Flip the Script; European Hip Hop and the Politics of Postcoloniality’, begs to differ. Speaking to Rollefson, he quotes Ralph Ellison: “it’s not culture that binds people of African descent but an identity of passions” – a succinct statement to represent Rollefson’s work, the first of its kind about European hip hop and how the world is a lot smaller than we may think. Post-colonial ripples are still being felt in many ways. Griffith, a San Francisco Bay Area native, was nearly finished writing his book ‘Flip the Script: European Hip Hop and the Politics of Postcoloniality’ when he took up his post as the first ever Professor of Contemporary music for UCC in 2014. He witnessed “the ways Irish hip hop artists know all too well how centuries-old colonial structures are echoed in the realms of finance, trade, media, governance, and religion”. “Indeed, Cork rapper, Ophelia McCabe, and Dublin’s Temper-Mental MissElayneous have been outspoken advocates of women’s rights in the run-up to the Eighth Amendment referendum — literally outspoken!” he said. By the time he arrived in Cork, his book was almost finished; he had chosen to focus on Berlin, Paris and London and the long lasting effects of World War Two. 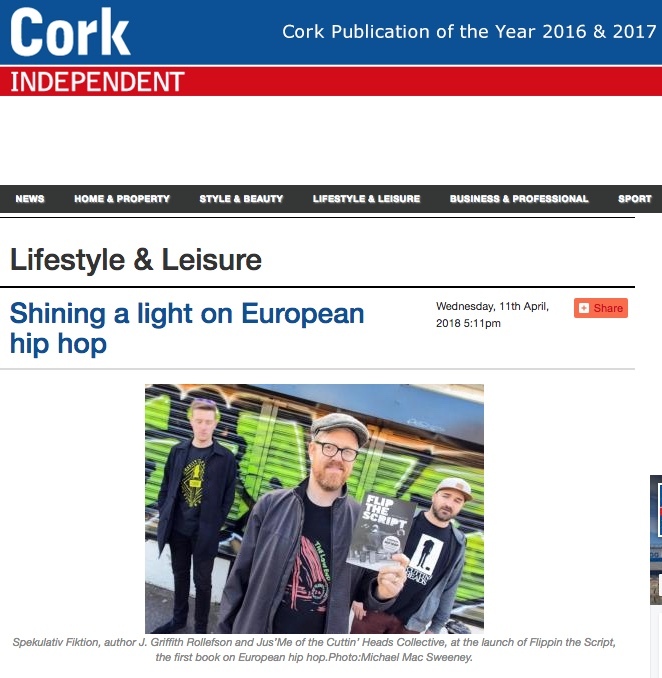 But when he came across the wealth of culture that exists in Irish hip hop, he felt compelled to include a conclusion in his book about Ireland after being amazed at the reaction that he received from the hip hop landscape of Cork. “They hear something, most won’t feel the historical weight but for those who do, something about its resonates, it speaks to you,” he says. Rollefson creates a narrative in which a shared political experience, and a search for knowledge of self is the bedrock for artistic material. Representation matters and if people that have a different accent then what is normally associated with a genre, Rollefson explores why we would shy away from recognising the hallmarks of a shared experience and a refusal to recognise the validity of such artistic integrity. The phrase ‘actions speak louder than words’ is exemplified in the video for Good Vibes Society’s (a Cork based hip hop duo) song ‘December 11th’, a song that commemorates the burning of Cork city on 11 December 1920 by the Black and Tans, but also draws parallels with the anti-colonial struggle globally by keeping the verse ambiguous. A stunningly layered and crafted piece of art, it is no wonder it was used as an example. It immediately brings to mind the work of familiar politically motivated artists like Immortal Technique or Pusha T.
Rollefson’s ethos is proved by the use of a Muhammed Ali speech at the end of aforementioned video. They sample a segment in which Muhameed Ali expresses his solidarity with the Irish people in the global anticolonial struggle. The use of this highlights the connection of one oppressed people to anther, exposing our similarities and outweighing our differences. Rollefson chose a very suitable anecdote to close the book. “Indeed, Ali returned to Ireland in 2009, near the end of his quest, to visit Ennis, county Clare, the birthplace of his great-grandfather, Abe Grady, who emigrated to the US in the 1860s and married a freed African-American slave. Griffith Rollefson will launch ‘Flip the Script: European Hip Hop and the Politics of Postcoloniality’, the first book on European hip hop in The Roundy on Friday 6 April from 8.30pm until late. Open to the public, the event is set to feature readings and videos from the author, European and Irish DJ sets from DJ Jus’Me, and live sets from Dublin hip hop legend Costello, Cork mainstay Spekulativ Fiktion, and local up-and-comers from GMC’s Music Generation Kabin crew, Gatch + Pacino Brady.